Are you trying to get a deeper understanding of how hybrid cloud scenarios can best serve your business? Just what are the elements of hybrid cloud for Microsoft's cloud platforms and services? What layers are common across them? You can download this multi-page poster as a PDF or Visio file or view it in a new easy-to-browse format. You can also print the six pages of this poster on tabloid format paper (also known as 11x17, ledger or A3). 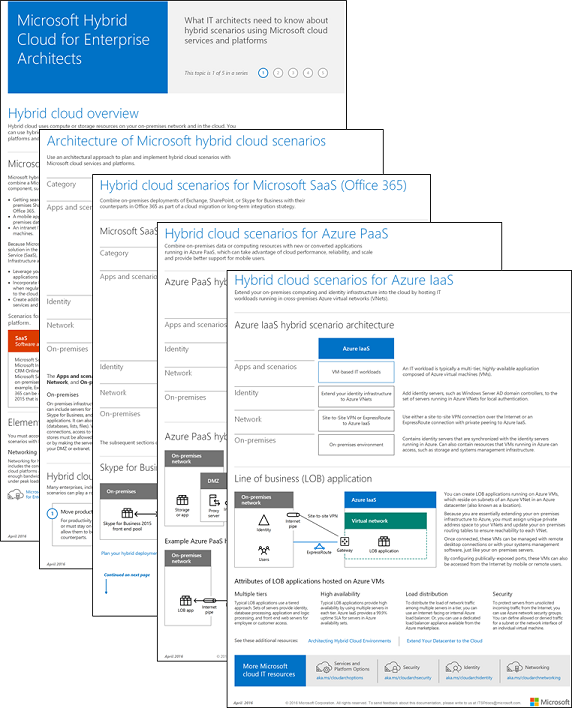 Also see the other posters in the Microsoft Cloud for Enterprise Architects Series. To see all the resources for Microsoft cloud platforms and services, check out Microsoft’s Enterprise Cloud Roadmap. Note to Twitter users: If you tweet about this poster or any others in the series, please use #mscloudarch. Thanks!